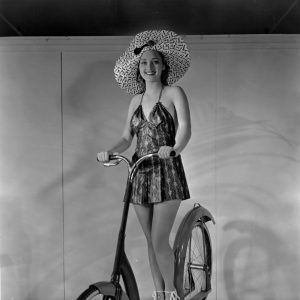 Marian Marsh rides an Ingo-bike. 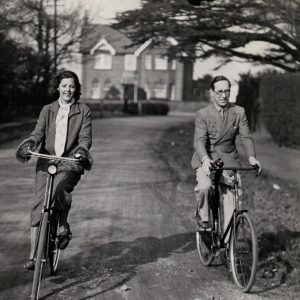 Jessie Matthews and husband Sonnie Hale ride bikes, Hampton, England, 1935. Evelyn Knapp and Earl Blackwell rest bikes. Actor and Actress Go Cycling…. 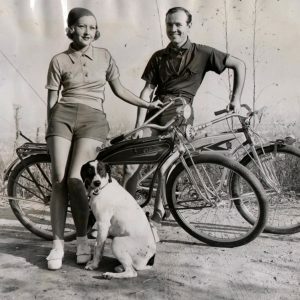 Evelyn Knapp and Earl Blackwell of the films pausing on cycling expedition into the Hollywood hills to give Miss Knapp’s pointer a rest. The actress is wearing the latest costume for fall bicycle riding: a wool jersey and flannel shorts. Acme Photo.